First time ever for Vijay! Two hot dads of K Town! Vijay’s Jitthu Jiladi track is a rare phenomenon! Vijay 60 costumer to fulfill dad's wish! When Ilayathalapathy Vijay met Superstar Rajinikanth! Ilayathalapathy Vijay fulfills a fan's wish! 3 for Vijay and 2 for Rajini; Suriya just joins! This page hosts a weekly slideshow related to Tamil movies. Each slide includes a picture and some description about that picture. All the slides will have a recurring theme. People looking for actress stills, actress images, actor stills, actor images, movie stills, movie images, and other interesting topics, relevant issues in Tamil cinema will find this page useful. HOW DO FELLOW STARS WISH VIJAY TODAY? 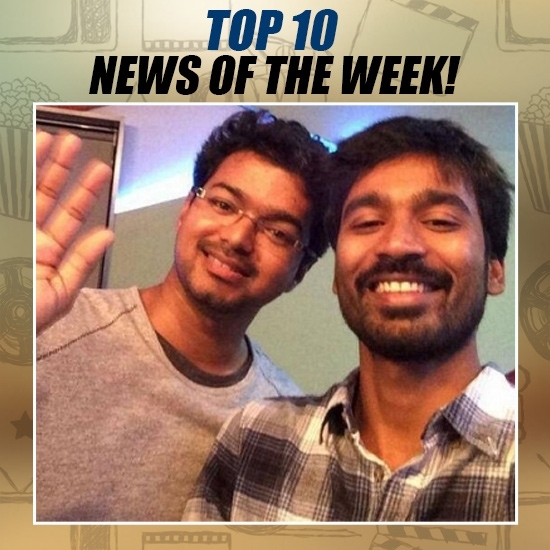 | TOP 10 NEWS OF THE WEEK (JUNE 19 - JUNE 25).